The Okanagan offers an amazing array of wineries from Osoyoos, all the way to Salmon Arm. Osoyoos and the south usually get the most attention when it comes to Okanagan wineries. Understandably, the climate has established this area as the ideal for most types of grapes. However, the Okanagan Valley covers about 250km, and you can find wineries along its length. I wanted to point out a few spots today where you can enjoy this delicious bounty, but at the North End of the Valley rather than the South. The furtherest North you can go to enjoy the unique cold weather wineries is to Celista, BC to Celista Estate Winery. This 160-acre farm and vineyard is located in a small community on the north shore of Shuswap Lake, a 2 hour drive from Vernon, BC. Celista Estate was established in 1995 and is now a multi-award winning winery. Along with the vineyard and winery, you can enjoy a small art gallery, view the icelandic horses, or rent one of the cozy cabins they offer their guests. So wether you go for just a day trip or make this an overnight getaway, I am convinced you will enjoy your visit at Celista Estate Winery. Not far from Celista in Kamloops, BC is Harper’s Trail. This vineyard and winery is a 1 hour, 45 minute drive from Vernon, BC and is owned and operated by Ed and Vicki Collett. 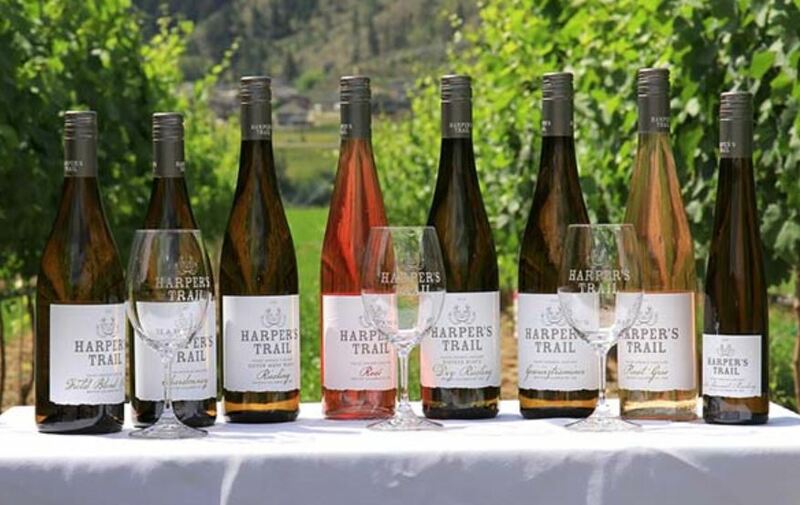 Harper's Trail, the first winery to open in Kamloops with wines made from 100% Kamloops grown grapes, was named after the pioneer rancher Thaddeus Harper. Harper’s Trail is located on the South Thompson River with a unique backdrop of Kamloops’ grass and sage covered hills. Harper’s Trail offers a Tasting Room schedule, or you can call ahead to book a private tasting. At an hour and 20 min from Vernon, Recline Ridge Vineyards and Winery is a great destination. This is a family-owned and operated vineyard, nestled in the heart of the Shuswap Lake area of British Columbia. This winery is noted for its production of award-winning wines known for their clean sound structure, intense flavours, and perfect balance. There is a tasting room and a unique wine shop. If the weather is great, you can enjoy the picnic and patio with your favourite glass of wine. Sunnybrae Vineyards & Winery is located between the shoreline of Shuswap Lake and the hills of Bastion Mountain. You can get to it from Vernon in an hour and 10 minutes, a worthwhile trip to explore the unique micro-climate offered by its location and the volcanic ash that gives the grapes their delicious taste. This craftsman style winery was built in 2010, and it now showcases some of the history of five generations of the farmers of the Sunnybrae area. Visitors are invited to the second floor wine tasting room to enjoy delicious white, red and rose wines. The views are promised to be spectacular, and the guests are encouraged to keep their eyes open for osprey sightings. A little closer to Vernon, BC, at a 50 minute drive, is Larch Hills Winery. This winery specializes in cool climate grape growing and have unique varieties, such as Ortega, that are generally not available in other parts of BC. Visitors are welcome for either a tour or to enjoy the grounds on your own, and tasting is available. The closest vineyard north of Vernon is Ovino, 40 minutes towards Salmon Arm. This vineyard utilizes the sandy and loam soils and clay layers that were produced by the last glacier, and is located on a sunny rise to make the most of the sun and drip irrigation. There are four acres of grapes, including pinot gris, pinot meunier, gewurztraminer and the cold loving grape marachel foch. This family run business welcomes visitors and offers tasting. So once again, I stress that there is no shortage of fantastic things to do in Vernon and the North Okanagan. I encourage you to explore and enjoy the area, and if you would like any suggestions or special recommendations about what else is available in Vernon, Coldstream or Bella Vista, please don’t hesitate to contact me! I would love to take the time to speak with you about why I love this area!